COLONIAL by TIFFANY was first introduced in 1895 and deigned by Paulding Farham. 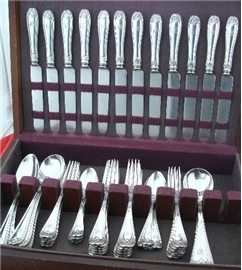 Offered is this Service for 12 in the handsome Colonial pattern by Tiffany. The set consists of the following pieces: 12 7 3/8” Dinner Fks. ; 12 8 7/8” Lunch Kvs. ; 12 6 ¾” Lunch Fks. ; 12 5 ¾” Tsps. ; 12 7 ¾” Gumbo Soup Sps. And 3 8 3/8” Tablespoons. - a total of 63 Pieces. The total weight, counting the knives as 1 Troy Oz. each, is 115.44 Troy Oz. All the pieces are monogrammed with the same pretty intertwined script monogram. The hallmarks have been photographed. SALAD SET, Mono, Gold Washed, 10"
Colonial by Tiffany all sterling silver 8 7/8" pierced pancake server.